Ok, so in reality this is probably the easiest way to preserve any type of pepper, but since I mostly preserve hot peppers every year I'm going to focus on those! Why do I preserve so many hot peppers, you ask? Well, it's because I don't like them...so 'we' certainly can't eat them all during the growing season. The easiest way to preserve peppers is to simply clean, chop and freeze them. 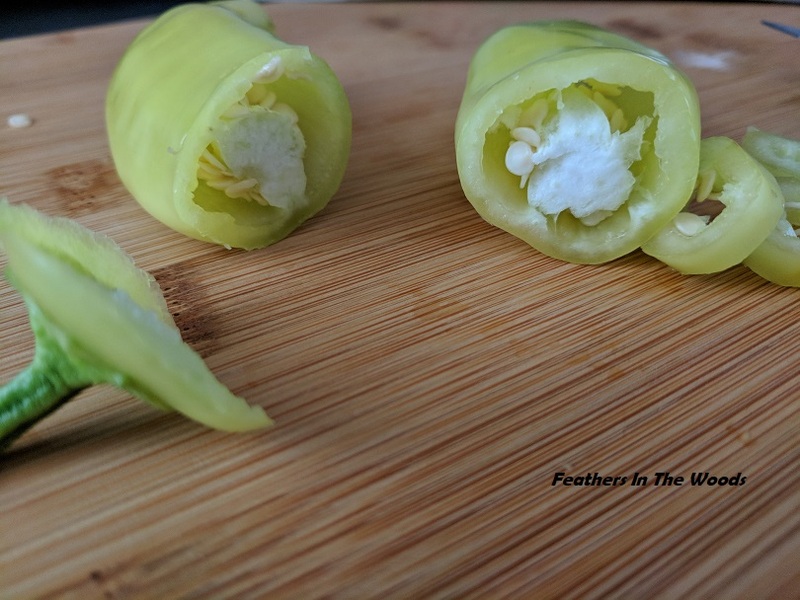 Not only is it a super simple method for preserving hot peppers, but they hold up great to freezing and do not lose any color or flavor when thawed. I got this method of preserving peppers from Aunt Donna. She is an aunt from my husbands side that can cook anything and everything from scratch. I love chatting with her about cooking, baking and preserving because not only does she have a stellar recipe for just about everything, but she cooks exactly the way my grandma did...by sight and memory. That's the way I learned to cook and I totally get her when she describes a recipe or method of doing things. Sure there's the occasional written down recipe, but mostly she just knows how it's supposed to progress from memory and tweaks it as she goes. Plus she's my only other relative that understands farm life! Anyway, I had a bumper crop of hot peppers many years ago and mentioned that I need to find a way to preserve them all and she rattles off this method. I've used it every year since! You'll want to wash your peppers before starting, especially if they came from a store or farmers market. Dry thoroughly with lint free towels. 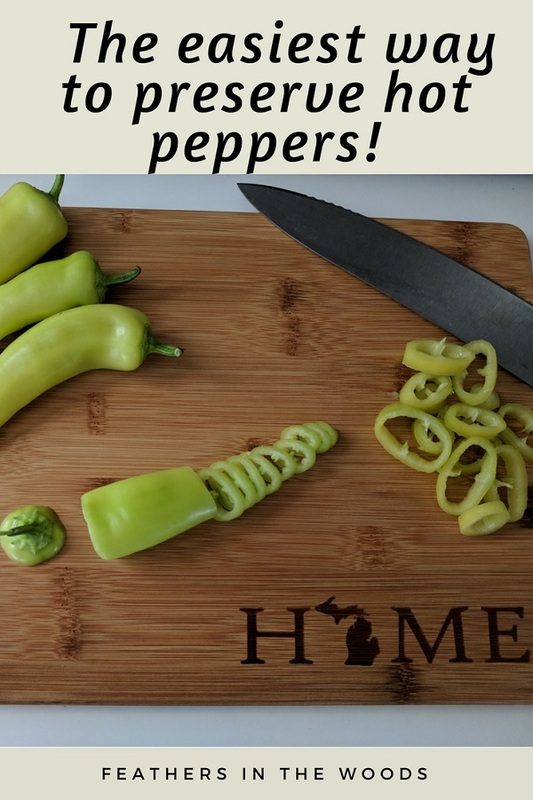 Excess moisture will cause the sliced peppers to freeze in a clump, so you'll want to make sure they are completely dry before cutting. Peppers do not require blanching before freezing, which is awesome since it makes the whole process much simpler. Next you will cut off the tops and remove the core. 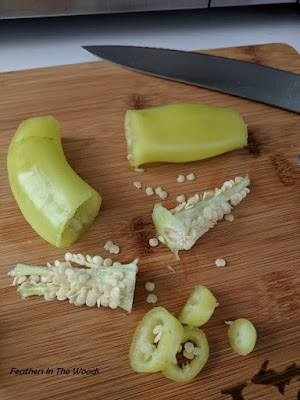 I remove the seeds also, but depending how you'll be using the peppers you could leave them in. Many people leave the seeds in when making salsa....check out this easy salsa recipe from The free Range Life. If you want to leave your peppers whole you can. 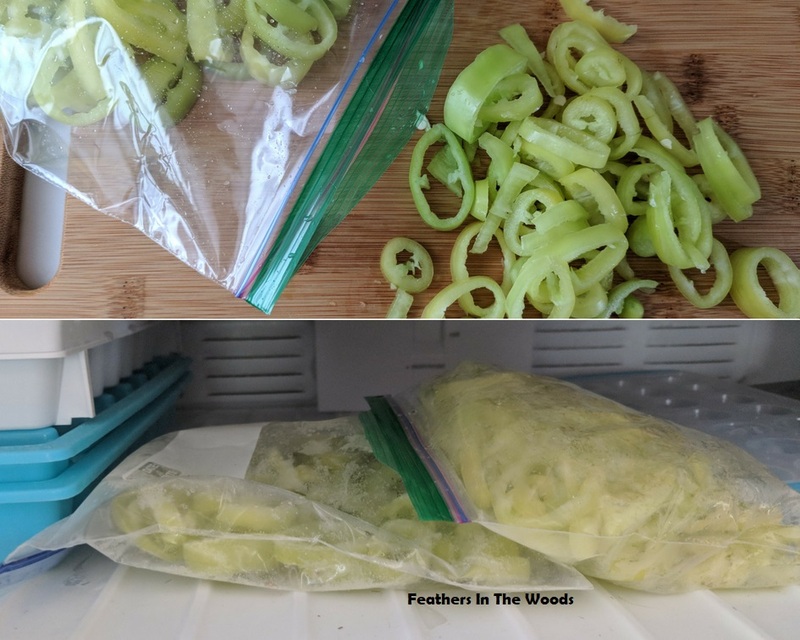 They'll take up more space in the freezer, but since they do not turn mushy after freezing, this is the perfect way to freeze them if you want to stuff them later. The husband prefers them cut small so they cook quickly, so I usually just cut them into rings. All you need to do now is to pack them into freezer bags and lay flat in the freezer. Allow to freeze for about an hour, then shake them up a bit so they don't stick together. Return to freezer. Frozen peppers can be stored in the freezer for about a year. You might want to put on gloves when cutting hot peppers. I always forget and no matter how well I scrub my hands afterwards, I always end up touching my eyes or mouth (even hours later) and it burns like crazy! It's absolutely ridiculous how long the hot pepper juice stays on the tips of your fingers and under your nails. Even after scrubbing in scalding hot water with Dawn dish soap! Trust me on this....use gloves!